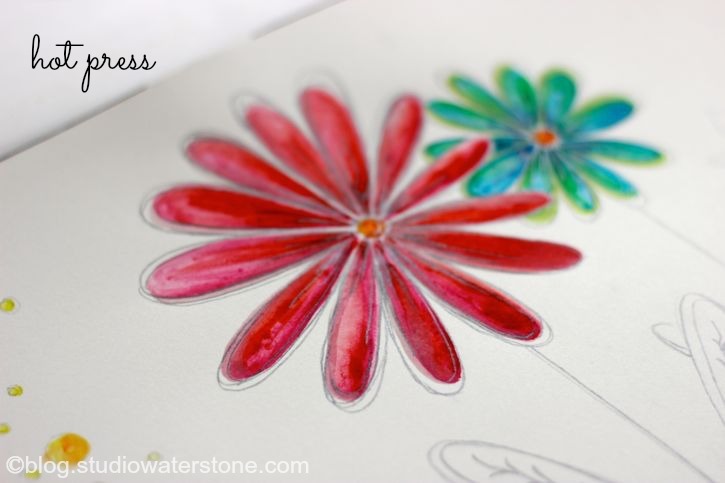 Part 2 of the Watercolor Painting 101 series should have been part one, right? And this, my friend, is why I do not claim to be a pro - just a dabbler who hopes that this series erases any fear you have of watercolor and leaves you with inspiration and excitement to move forward and create new things. Last week we discussed the importance of understanding color. Today, it's all about paper and brushes. I'll do a brief explanation of each, highlighting my favorites and leaving you with a new assignment. 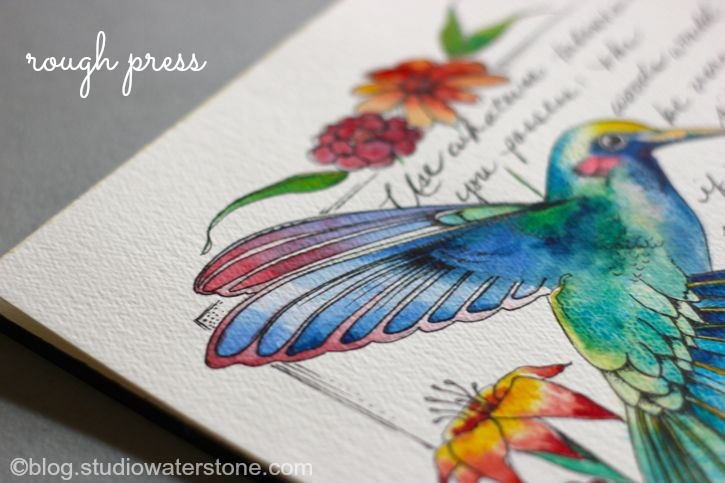 Watercolor paper can be purchased as individual sheets, in pads, or in blocks. Blocks are stacked paper which have glue around all four of the outside edges, preventing the paper from buckling when wet. The image above shows loose paper on the bottom, a yellow watercolor pad and three watercolor blocks (notice the black glued edges around the blocks). 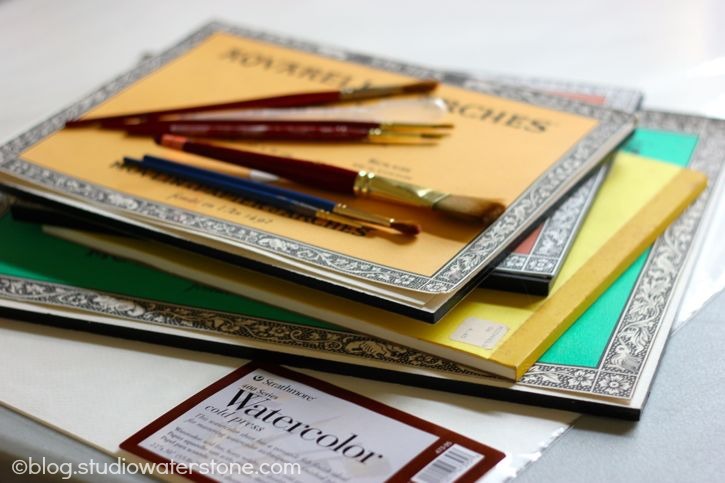 Watercolor paper is distinguished by weight (thickness and sturdiness) and texture. Weight: The most popular weights for watercolor are 90, 140, and 300-pound. 90-pound is the lightest paper. It tends to buckle more when wet and doesn't take scrubbing as well. However, it's cost effective and great for sketching and light watercolors. 140-pound is the most commonly used. It has a better weight and can stand up to more scrubbing. Because it's heavier and moderately priced, I use this weight with all of my painting these days. 300-pound is what I consider a professional weight. I used this weight exclusively when doing commissioned portraits. It has minimum buckling when wet and stands up to scrubbing. As a result, it's also the most expensive paper. Texture: Refers to the surface finish of your watercolor paper. 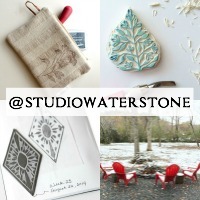 You can purchase hot press, cold press and rough textured paper. Each type results in different visual and paint effect. 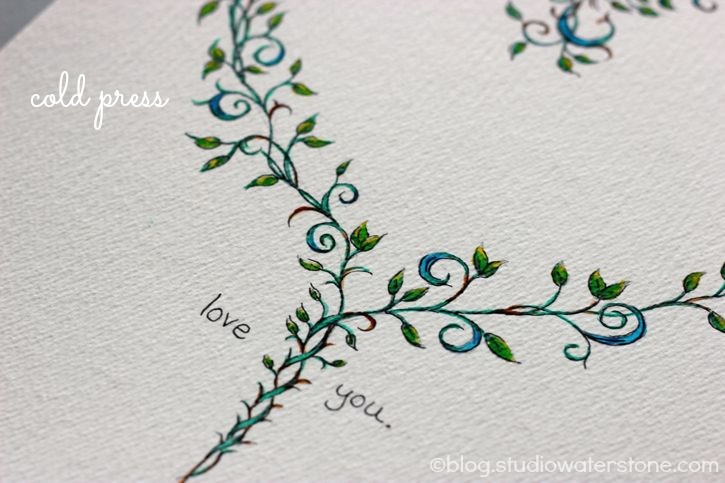 Cold pressed paper has a moderate texture and is the most popular with watercolorists. 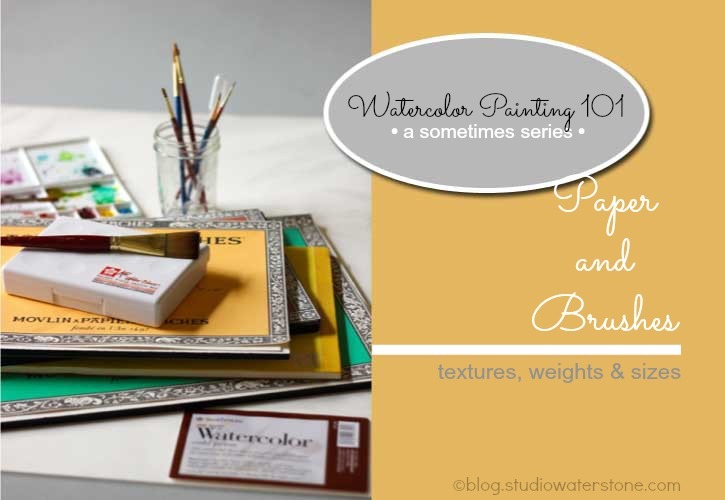 Rough watercolor paper has the most textured surface and as a result is great for landscapes and more textured effects. NOTE: Starting out, I would recommend that you purchase a moderately priced watercolor pad, 140-pound cold pressed such as this one or this one from Strathmore. Be sure to use one of the 40% coupons to buy materials! You can get these coupons from Michaels, JoAnn Fabrics, and AC Moore. You can even download their Apps and have the coupons on your smart phone. 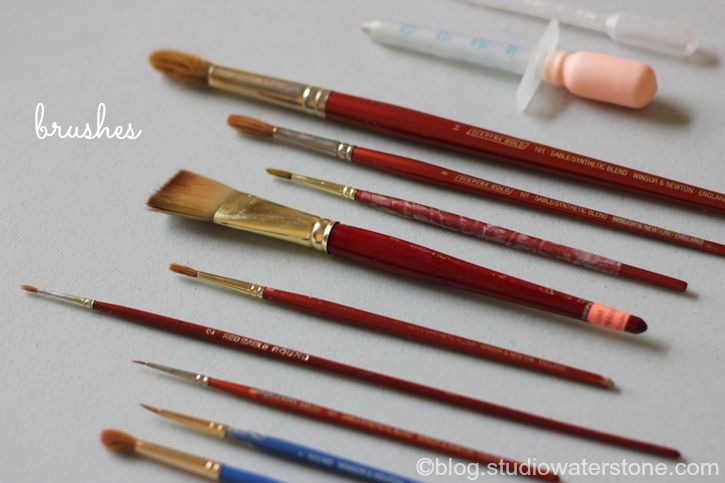 Watercolor brushes have long, absorbant hairs with the most professional and expensive being natural sable. Brushes come both short and long handled but I prefer short. My favorite brushes are the Winsor Newton Sceptre Gold Series because they have a blend of both sable and synthetic fibers, retain their points well and hold lots of paint. They are very moderately priced compared to natural sable brushes. As for size and shape, it really depends on how you work. I tend to work smaller than some so I prefer round brushes and would recommend two or three to begin - maybe a #8 or 10, #5 and if desired #1 or 2. (Remember I work smaller) If you're just getting one brush, make it a medium sized, round brush like an 8 or a 5. If you're just starting out, don't spend much until you know that you're into this. Then maybe upgrade one brush at a time. I would recommend that, once you know you want to further explore watercolors, you invest in the best quality brush you can afford - you won't regret. Remember - use those coupons! Whew! Sorry for the length. This is an overview, so if you have any questions at all, feel free to ask away and I'll help as much as I can. Familiarize yourself with the various materials above and feel free to ask questions. Painting: Dip your brush into a clear glass of water and spatter a bit onto your paper allowing the water to pool. Now dip your brush into your paints and add bits of paint to the dry paper while also allowing the paint to spill into the wet areas. Notice how a wash begins. You're playing now so have fun! Continue to add different colors of paint, creating washes and exploring different color combinations. While working, note the combinations which become muddy. TIP: If your paper gets too wet as you're working, use a hair dryer to quickly dry your work and then continue to paint on the same paper by layering your paints even more. SHARE: Once you've done these exercises, feel free to come back here and add a link to your work via your blog, Flickr, Instagram, Twitter or Facebook. If tweeting, be sure to use #watercolor101. Also, be sure to link up right here with Linky! Fun post!! I love your photos and great info! I'm loving this Lori! There's a lot of great info in this post! Had no idea about the different textures of the paper. Looks like I need to plan another trip to Micheal's to peruse the watercolor aisle! YAY!! Thank you so much for all you are putting into this, Lori! This is so helpful, Lori - excellent explanations!